Shoppers may have been surprised to see the first Black Friday ads leaked in September and early October, but retailers have in fact been preparing for months. Why? The haul is huge, but retailers have to get their pitch, deals and sales exactly right to keep up with the fierce competition in modern retail. 86.3 million consumers shopped on Black Friday at both offline and online stores. Shoppers spent $52.4 billion over Black Friday weekend. The average shopper spent $398.62 over Black Friday weekend. 24.4% of Black Friday shoppers took advantage of midnight openings on Black Friday. All statistics are taken from the National Retail Federation’s 2011 Black Friday survey. For retailers looking to sell in a struggling economy, Black Friday represents tremendous opportunity – not just to make profits off enthusiastic spenders but also to offer steep discounts to grab shoppers’ attention and stand out from the crowd. So, how do retailers plan to make your Black Friday experience a memorable one? We’ve interviewed a few experts in the industry and have listed out their top strategies below. 1. Retailers want to keep up with the times. By now, you might have liked your favorite retailer’s Facebook page or followed a merchant on Twitter. Retailers have become more and more assertive in promoting limited-time offers, special coupons and giveaways through their social media channels to increase engagement amongst their consumer base. Goldstone’s insight is key – businesses want to interact with what their customers want out of social media instead of forcing their retail onto an unwilling audience. For ScanMyPhotos.com, Instagram is changing how ScanMyPhotos clients and potential clients view the company’s core services and products. Lesson for shoppers: Use social media to connect with retailers, but if you don’t want merchants clogging up your news feed with promotions, create a new social media account just for getting special social media promotions. It’s no secret in the e-commerce industry that more and more purchases are being made on tablets and smartphones. But while customers see mobile device shopping as a few taps of the finger, retailers see some pressing logistical challenges. The key here, says Ken Godskind, Vice President of Monitoring Products for SmartBear Software, a software solutions company, is to embrace the whole mobile shopping experience rather than just the checkout stage. “Ensuring that search, product detail and reviews work well from [smartphones] and that the entire shopping process is optimized for [tablets] is a key objective,” notes Godskind. Lesson for shoppers: Not all retailers have a good mobile site. Skip it if the site is too frustrating to navigate. 2. Retailers know they need to offer value – real, noteworthy value. With a dizzying mix of loss leaders, sharply discount items, full retail prices and advertising barrages Black Friday can confuse even the smartest shoppers. One solution for retailers? Make it all as simple as possible. Offer a great value and nothing else. “The biggest [trend] is that consumers want discounts – real, valid discounts. Ones which are not offered at any other time,” emphasizes Goldstone. ScanMyPhotos.com is planning to offer $200 e-commerce gift certificates for $100 as the company’s feature deal. “It’s really important to have something in place that absolutely incentivizes people – having extraordinary deals where consumers ask the question, ‘Are you crazy? How can you offer such a discount?’” says Goldstone. Goldstone also warns against the dangers of offering limited-quantity items, rebate pricing or fine-print specials on Black Friday. “You can’t just have a gimmick. That turns off consumers,” he states. Lesson for shoppers: Do your research. Check out Black Friday ads ahead of time and don’t get sucked in by bamboozling retailers taking advantage of the Black Friday name. 3. Retailers are expanding sales and promotions beyond just Black Friday. Think that Thanksgiving and Christmas are sneaking up on you sooner and sooner every year? You’re not actually losing your mind – you’re actually right. In post-recession years, hard-hit retailers have had to drum up sales by offering holiday discounts sooner and sooner. Shopping procrastinators can relax as well. Sales have even been extended later into the holiday season, too, as Godskind notes. “The online holiday shopping season peaks seems to be flattening a bit as the years tick by. We are beginning our holiday shopping promotions earlier and earlier and shoppers are ending it later as better shipping logistics and last minute options are more available,” says Godskind. Lesson for shoppers: Black Friday won’t necessarily have the best deals of the season. Buy when holiday shopping makes sense for your schedule. 4. Retailers know they need to engage like never before. Retailers know that customer experience is a key of any business. What’s different now, however, is that retailers have new ways of personalizing communication, says Damien Acheson, Head of Product Marketing at LivePerson Inc., an online consumer solutions company. “LivePerson recently conducted a survey that revealed 63% of those polled are planning to do the majority of their shopping online. They’ll be interacting with brands, not only on its website, but via mobile application and social media networks as well. I think the main difference we’ll see this year are companies seeing and realizing the importance of being able to target customers in real-time, with relevant offers and simplifying the order process entirely so that a customer can have an excellent experience whether logging on from their smartphone, tablet or desktop,” says Acheson. Goldstone as well weighs in how great customer experience has to be a focus, not a perk. “You want this to be an extraordinary experience where people leave your store or ecommerce business thrilled and telling everyone what a great experience you had,” Goldstone states. Lesson for shoppers: Online shopping will hopefully be simpler and easier this year. 5. Retailers are trying to make things simple. Complication kills and transparency matters. “It is important to employ intelligent use of your content – using tools like live chat and click-to-call can help businesses manage and better understand the consumer experience. For example, just from one live chat conversation, you instantly learn that the checkout page has errors, and you help a customer complete a purchase, which was potentially lost,” says Acheson. Lesson for shoppers: Contact the retailers if there’s a problem. If it can’t be fixed for you quickly and easily, take your business elsewhere. 6. Retailers are getting the logistics into place. The details can be the most frustrating – but customers expect everything to go right. Having a backup plan is key for any merchant that does so much business on one day. “Assuming most small businesses rely on a hosted retail Cloud platform my biggest recommendation from above is have a Plan B,” says Godskind. “When Yahoo stores went down in 2007 leaving many ecommerce sites stranded our friends at Vermont Teddy were ready with a plan B and minimized the business impact of the Yahoo outage. They immediately put up a page with a 1-800 number and called in staff to take orders ensuring they could still take orders the old fashioned way. Lesson for shoppers: If a retailer’s website crashes, check back in later in the day to see if the retailer has provided another way, like a 1-800 number, for you to complete your purchase. 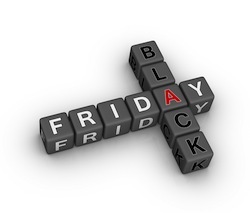 Black Friday image from Shutterstock.